Boss tries to crash the organization of workers in Akkardan! Akkardan is a factory in metal sector in Gebze which is an industrial center near Istanbul. It employs about 360 workers. 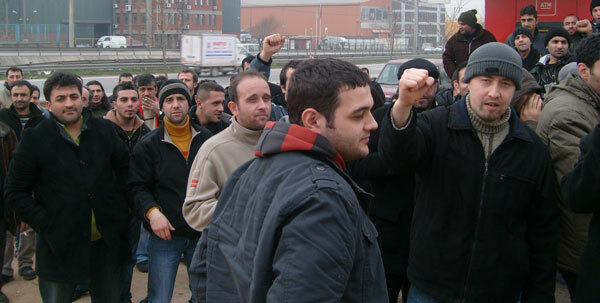 Akkardan workers has been organized in a trade-union called Birlesik Metal-Is for years. Like everywhere the boss tries to put the cost of the economic crisis on the shoulders of Akkardan workers. With the outbreak of the crisis, the boss forced workers to use up their annual leaves. As a next measure, the boss fired some workers. And then to utilize the government-funded crisis package changed the work schedule so that workers can work only three days a week which means part-time work. According to the law, this type of production can continue only for a period of six months. After six months the government, not the boss, can decide a second six month prolongation. Towards the end of this second period, Akkardan workers have begun to consider and eventually decide to act upon. And after every lunch, they started to protest the boss by applauses. At the end of the second period, the boss forced 109 workers to take their leaves. While the workers were on their leave, they received notifications that inform them about their contracts being terminated. That was a signal and has a meaning that the day of struggle came for the workers. They established a committee and started a struggle fund. They pressured to get support from the union and succeeded. Now they are in a resistance (a wildcat strike) and fighting for their jobs. Every day they gather in front of the factory with their families. Those workers who are still working in the factory support their fired friends and their struggle. At lunch time they bring their meals to their struggling friends. Akkardan workers need and look forward to your support and solidarity.